Please visit our fabulous sponsor this week, Little Blue Button Stamps, to see all of their wonderful products! 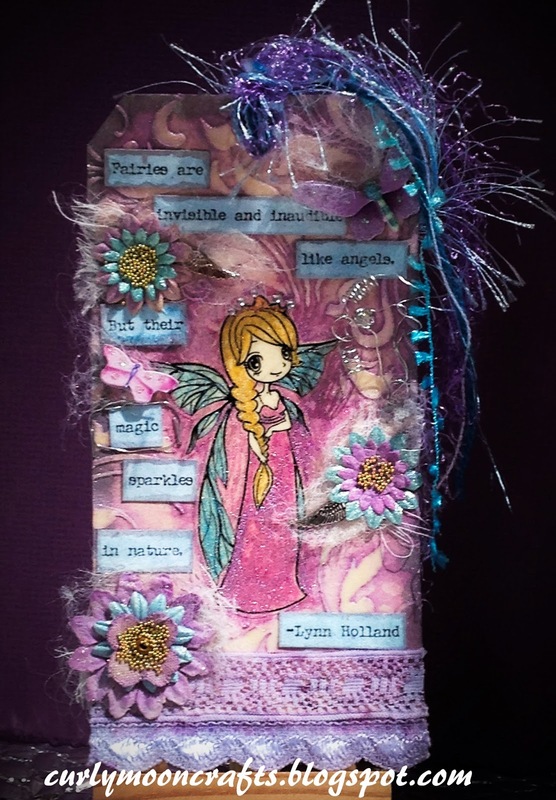 My creation for this week is a Fairy Tag using the Princess Fairy digital stamp from our sponsor. See below for my creative process and supplies. Thanks for stopping by and have a great CRAFTY day! The tag was created by printing the image onto copier paper, then doing a packing tape transfer to place the image on the manila tag. I used CM Iridescent paint with the Tim Holtz Flourish stencil to add texture to the background. I painted the image and flowers with the below colors of Viva Decor 3D Stamp Paint, then printed the quote onto cardstock and painted it with a wash of the same light blue metallic paint and layered them around the fairy image. I colored the lace trims with a combination of the rose paint and Distress Stain in Milled Lavender. Once the trim was added, I layered the flowers and added seed beads/tiny marbles to the centers - with a touch of cheesecloth and dryer sheets behind them. I added a couple of wing charms, some hand made wire flowers, and some gems to the crown. I added a couple of layered butterflies and some fluffy yarn fibers to finish off the fairy-tale effect. This is stunning,Patti.So much beautiful detail and wonderful techniques.